A Division of SRL (Bead Blast) ltd.
Nylon is a top quality, resilient environmentally sound product. It is manufactured from the oil from the Castor plant. It offers a superior finish in addition to first class chemical and atmospheric protection by providing a superior resistance to solvents, oils and other chemicals. Nylon is extensively used in the water industry where it not only protects the installations it also protects the water quality, meeting WRAS and DWI certification standards. Building Regulations – M1/M2 with regard to access and use of buildings were changed in May 2004. 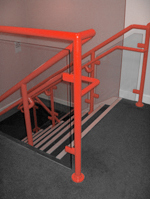 The regulations now stipulate that handrails should be ‘slip resistant and not cold to the touch’. Architects and designers are increasingly requesting nylon coating as it offers a superior thermal conductivity than that of traditional Polyester Powder Coating. 100- 150 microns is typical for an electrostatic application. Applied by an electrostatic spray, nylon coatings are supplied in a comprehensive range of BS 4800 and RAL colours. The coating is impact and abrasion resistant, strong with low coefficient of friction. Nylon coating is applicable in many circumstances. We provide sheet metal coating services for large peices of metal that require protection with a nylon coating. Sheet metal coating can include a variety of applications. Examples of how nylon coatings have been used include: handrails, safety bars, wiring, light switches, automotive parts, furniture parts, turned parts and many more. Give us a call for more information and for advice on the best coating for your business. Burnley Bead blasting commonly applies nylon coating to the handle and grab rails of the PSV industry. Users of trams, trains, buses and coaches prefer the use of nylon as a coating due to the coating’s strength and smoothness of touch. Burnley Bead is a Division of SRL (Bead Blast) Ltd.